The Intersections & Beyond: 3rd Entrep Summit: Click! Technopreneurs' Secrets, Revealed! 3rd Entrep Summit: Click! Technopreneurs' Secrets, Revealed! For the three years now, JCI Manila (Manila Jaycees) has been staging the Entrep Summit – a gathering of prominent entrepreneurs from different fields who share their experience and life lessons in the hopes of encouraging or inspiring individuals to pursue their entrepreneurial aspirations. 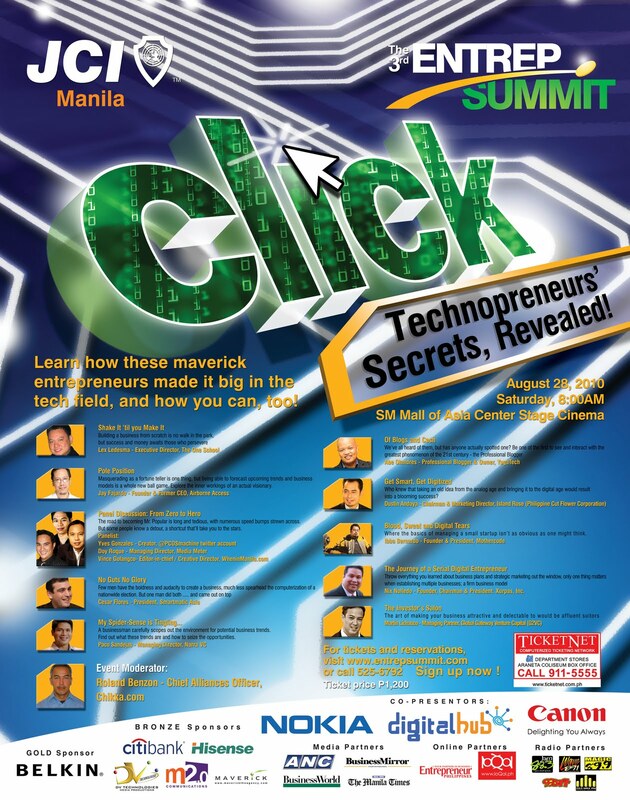 This year’s Entrep Summit titled “Click! Technopreneurs’ Secrets, Revealed!” will feature trailblazing entrepreneurs who have been successful in tech and digital media related endeavors. This project encapsulates one JCI-Manila tenet that "economic justice can best be won by free men through free enterprise" and cement JCI Manila as a leadership organization actively participating in the business concerns of young leaders and entrepreneurs. Being the lifeblood of the Philippine economy, the SMEs should consciously adapt and grow with market changes and take steps to attaining their business goals - thus coining the term "Entrep Summit." The Entrep Summit will be held on August 28, 2010, SM Mall of Asia, Center Stage Cinema at 8:00am - 6:00pm. Tickets are available via Ticketnet and at www.entrepsummit.com for Php1200. Please leave a comment, your full name and email address if you want a complimentary ticket to this awesome seminar and tell me why you need it and why you should be given the ticket. ASAP please. Limited complimenatry tickets will be given away. Building a business from scratch is no walk in the park, but success and money awaits those who persevere. Masquerading as a fortune teller is one thing, but being able to forecast upcoming trends and business models is a whole new ball game. Explore the inner workings of an actual visionary. The road to becoming Mr. Popular is long and tedious, with numerous speed bumps strewn across. But some people know a detour, a shortcut that’ll take you to the stars. * Founder & VP Software Design, Giro AppSolutions, Inc.
We’ve all heard of them, but has anyone actually spotted one? Be one of the first to see and interact with the greatest phenomenon of the 21st century - the Professional Blogger. Who knew that taking an old idea from the analog age and bringing it to the digital age would result into a blooming success? Where the basics of managing a small startup isn’t as obvious as one might think. * Co-Founder, E-motion Systems, Inc. The art of making your business attractive and delectable to would be affluent suitors. A smart businessman carefully scopes out the environment for potential business trends. Find out what these trends are and how to seize the opportunities. Throw everything you learned about business plans and strategic marketing out the window, only one thing matters when establishing multiple businesses; a firm business model. * Founder, Chairman & President: Xurpas, Inc.
* Chairman & Majority Shareholder: MyAyala, Inc.
* Chairman & Shareholder: Fluxion, Inc.
Hi! I would want one ticket because me and my sister are attending and my brother wants to attend but has no ticket. We will converge our ideas to create one super idea that will help create additional jobs in the country. Hi! I am open for entrepreneurship trainings. @Athens: You still haven't stated your reasons. Please follow the guidelines. Thanks!